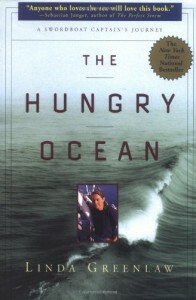 In The Perfect Storm, Sebastian Junger offered Greenlaw a shout-out, describing her as “one of the best sea captains, period, on the East Coast.” The Hungry Ocean is Greenlaw’s story. She offers a reasonable share of personal history, tells of the social up and down sides to spending so much of her life on the water, communicates effectively her love of the sea, but most of all, this book give us detailed descriptions of what it is to work as a fisherman. There is a sometimes painful level of detail in her telling, with work-specific jargon enough to fill a small dictionary. I enjoyed her descriptions of her crew members past and present. She succeeds in communicating much of the danger involved in this life-threatening career, from the elements, inadequate crewmen, competing captains and an unforgiving market. Next to the term “hard work” in any dictionary there should be an illustration of a fisherman. The work sounds exhausting. I was surprised that she seemed to have little appreciation for the effects of overfishing on the sea’s ability to continue offering up an adequate supply of fish. This is not a great read. Junger is in no danger of literary competition here. But Greenlaw succeeds in her mission of letting the rest of us know what it takes to put on the table the fish we eat. In that regard, the hold is full and she is steaming home to port.